High school junior Jose Palma will join the new UC program at the club in Pasadena. Students who attend three Boys & Girls Clubs in California will be getting extra help and encouragement on a path to University of California enrollment through a new partnership announced Wednesday. Under the program, UC will provide academic counseling, campus visits, financial aid advice and other support to the mainly low-income and minority young people who attend the clubs. A first phase will link three campuses and three local Boys & Girls Clubs that serve a total of 6,000 children and teens: UCLA with the club in Pasadena and UC Merced and UC San Francisco with clubs in their respective cities. UC and club officials said they hope to expand the efforts statewide after the first year. In announcing the program at the Pasadena club, UC Board of Regents chairwoman Monica Lozano said the new effort is part of a wider strategy to expand the university’s reach and find promising students who might otherwise never apply. “We want to give them the sense they can aspire to a UC, and we are prepared to do everything to help them to be ready to be UC eligible,” she said. “We want to give them the sense they can aspire to a UC, and we are prepared to do everything to help them to be ready to be UC eligible,” said UC regents chairwoman Monica Lozano. As part of their help, the UC schools involved will be tracking students’ progress in high school to make sure they take classes and standardized tests required for UC admission and assisting them in getting enrolled in campus “Early Academic Outreach Programs” that acquaint them with UC faculty, students and majors. 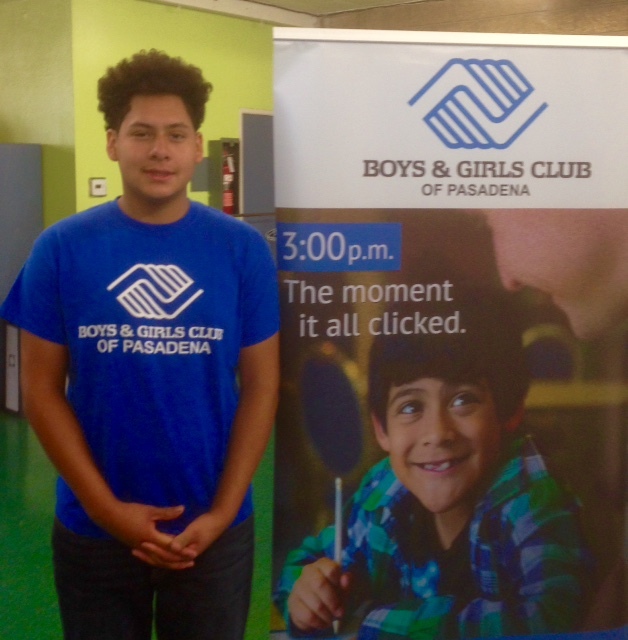 The Boys & Girls Clubs of America — which serves about 4 million young people at 4,200 clubs nationwide — have started similar arrangements with other colleges, including the University of Wisconsin at Madison, Amherst College in Massachusetts and Atlanta Technical College, according to Damon Williams, the national organization’s senior vice president and chief educational and youth development officer. The UC partnership is the first with an entire university system and is especially important because of UC’s strong academic reputation, Williams said at the Pasadena club. 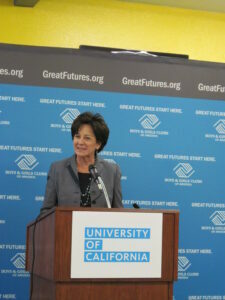 Monica Lozano, chairwoman of the UC regents, spoke at the Boys & Girls Club in Pasadena. Wednesday’s event attracted high-ranking elected officials, most notably state Senate President Pro Tem Kevin de León. He spoke about how too many high school students in low-income areas lack access to the advanced placement and honors courses that give others an advantage in university admission and noted that only 42 percent of the state’s high school graduates take all the so-called A-G classes required by Cal State and UC. “In too many cases, the students’ zip codes, their parents’ tax bracket or, quite frankly, the hue of their skin or their legal status or the language they speak is the difference between admission to a university or rejection,” said de León. Helping to level the playing field and boost college enrollment with programs like this, he added, is both a moral issue and an economic one for the state’s future. Many Boys & Girls Clubs already have their own College Bound programs that aid students with their applications and offer tours of schools. In a partnership with the College Board, some clubs have started using the free online Khan Academy tutorials to prepare students for the SAT exams. Your sense of entitlement is disgusting. You are not “paying for the rest.” If anything, “middle class people from San Diego” are over-represented. In actuality, “The rest” are paying for the “middle class people” from San Diego.